My biggest concern about our trip to Germany wasn’t the cost, it wasn’t foreign language, it wasn’t even sauerkraut, I hate sauerkraut, it was the nine hour flight with a one year old that has a reputation for being “busy”. Our flights were from Omaha to Atlanta and then on to Munich, the flight from Omaha to Atlanta was…well, good I guess. I don’t actually remember it, so it must have been fine, the flight from Atlanta to Munich is where things got a little interesting. We landed in Atlanta with plenty of time to catch our flight to Munich, which was mostly during Elena’s bedtime so it would work out nicely, so we got a little dinner and slowly made our way to the gate. We had been sitting there for about 5 minutes when they called me up to the front desk. They asked if I had a child’s ticket for Elena, I looked at them funny and told them that she is going to be sitting in our lap. They informed me that for flights into Germany, even if she sits in your lap you need a ticket, it is not actually a seat, just a piece of paper saying she is on the flight and directed me to the help desk or whatever they call it. I figured I’d go up and tell them I need a child ticket, they would print one off and we would be on our way…of course it wasn’t that easy. It turns out for a” Child’s Ticket” you have to pay the taxes on what a regular ticket costs, so about 10%. Ok, not the end of the world except it took the lady nearly an hour of talking with someone in Germany and typing on her damn computer to get it all straighten out, mean while they have been calling final boarding for our flight! Luckily they knew I was down there and had no intention of leaving without us but it was still quite nerve-racking. They asked me a number of times “No one told you, you needed one of these in Omaha?” Nope, the people in Omaha very nicely helped us check in with Elena and asked what we are going to be doing in Germany, but never mentioned that we didn’t have all the paperwork we needed to actually get into the country with our daughter!! In all reality the people at Atlanta’s airport where very nice and worked as fast as possible to get this all straightened out, as for the people in Omaha…they are idiots! So I got to have one of those movie scene moments where I am running through an airport to catch my plane, which made me regret my choice of flip-flops for footwear. We got on the plane, Gillian and I both all flustered so naturally we yelled at each other for the next 30 minutes until we both realized we were all on the plane and everything was fine…well, kind of. We were seated in the middle three seat in the last row before the bulkhead, right next to the bathrooms so people were constantly standing next to our seats and well, it smelled like a bathroom. That really wasn’t that big of a deal though it was convent when we needed to change Elena’s diaper which unfortunately happened a lot! The biggest problem was that the plane had these really nifty touch screens on the back of every seat so you could watch movies and TV shows and it also controlled our over head light, or I should say it would have if it was working. Even more annoying was that it wasn’t the entire plane just the section we were in and since we couldn’t turn on the overhead lights the flight staff left the main cabin light on when it started to get dark so most people could read. It was very considerate for those people, incredibly annoy for the couple trying to get their daughter to sleep. Thankfully they eventually went around and asked everyone if it was ok to turn off the light, I think mainly because they knew we were trying to get Elena to sleep. Elena did manage to get to sleep and was very good through the entire flight and even though there seemed to be one catastrophe after another the Delta flight staff did a very good job of being as accommodating as possible. It was all about the little things, as they headed up to the front of the cabin to start handing out meals they stopped and gave Gillian her meal first so she could eat while I held Elena and then I ate when they came to our row, this was incredibly helpful and also something we would not of even thought about. They were also just very nice to us and sweet to Elena, it helped that she was not screaming the entire time. I was afraid that everyone would think “great, there is damn baby on the flight” and be rude or hostile, but it was the complete opposite. The flight back was much less eventful, the people at the Munich check in desk were also very helpful and changed our seats to put us behind the bulkhead which gave us more leg room and they could mount a cot for Elena to sleep in, seeing as it was a morning flight she didn’t sleep much but when she did, it was the greatest thing ever invented in all of the known universe. It also gave us a place to put her stuff when she wasn’t in it. Our screens also worked on this flight though due to Elena not sleeping it took Gillian 9 hours to watch an hour and forty five minute movie, I didn’t even try. The flight attendants on this flight were mostly new grandmothers so they just loved Elena and commented a number of time on how well she did, they even gave her a set of wings. What I thought was going to be the most stressful part of our trip..was, but it wasn’t nearly as bad as I thought it would be. After this I am confident we can travel with Elena anywhere, though once she turns two we have to buy her a real ticket so I am guess the next international flight the Frost’s take, Elena will get to spend quality time with her grandparents. 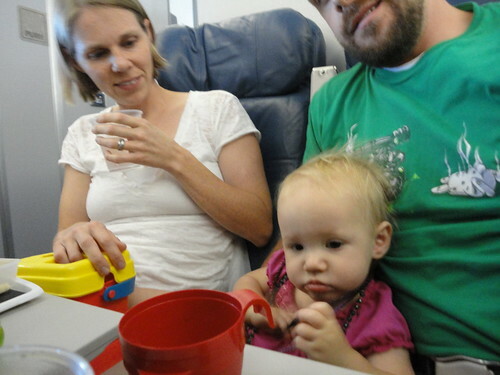 This entry was posted on August 24, 2011 at 1:22 am and is filed under Parenting, Rants, Trip. You can follow any responses to this entry through the RSS 2.0 feed. You can leave a response, or trackback from your own site.